A heavy set of features without a heavy price. 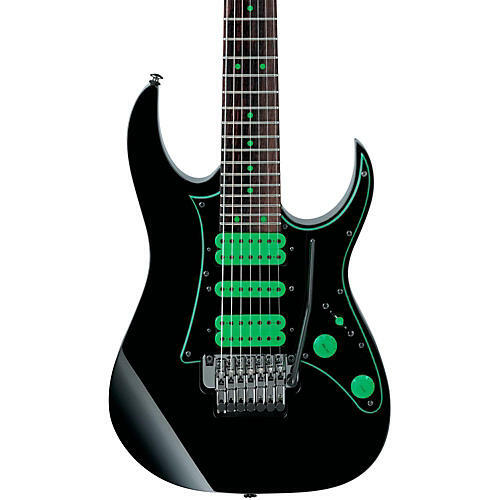 The Ibanez Premium Steve Vai Universe 7-String Electric Guitar is an exciting 7-string solidbody capable of exploring the most extreme sonic territories at any speed and at a price that's hard to resist. The 5-piece maple/walnut neck with KTS TITANIUM rods is super-smooth for easy riffing and incredibly strong and stable with a lead-friendly thin and flat profile. A 25-1/2" scale and bolt-on neck joint get you lots of bass and treble response with a quick, precise attack. A 48mm nut provides comfortable string spacing and 24 jumbo frets deliver greater range while the recessed tremolo provides right-hand playing comfort and allows notes to be radically raised as well as lowered. The American basswood body produces clear, full-bodied vintage tone that serves all your needs from chunky rhythms to searing leads. A trio of screaming DiMarzio Blaze pickups (humbuckers at the neck and bridge with a custom single-coil in the mid position), coupled with Split-5 wiring give you all the tonal diversity you crave. Trust the master and some master craftsmanship to keep it within budget. Order this special guitar today.